We’d love your help. Let us know what’s wrong with this preview of Ameriguns by Scott King. Lone-Wolf Gunmen Terrorize the Nation's Capital! After surviving a mass shooting, FBI Agent Nathaniel Ryder is forced to confront his worst fears as AMERIGUNS, a group of lone-wolf gunmen, put Washington D.C. under siege. When Ryder's superiors suspect him of orchestrating the terror, he must go on the run, unable to trust An alternate cover for this isbn can be found here. To ask other readers questions about Ameriguns, please sign up. In a world where the nightly news is filled with stories of crazed gunmen on the loose and one countless mass killing after another, have you ever imagined how horrifying it would be to become a part of the evening news? 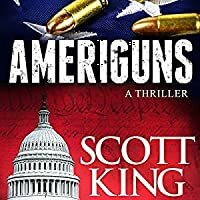 That’s the nightmare that Scott King so realistically brings to life in Ameriguns – a fast-paced, adrenaline-pumping thriller that had me hooked from the very beginning of the book! Ameriguns tells the story of Nathaniel Rider – an FBI Agent whose descent into horror begins when h In a world where the nightly news is filled with stories of crazed gunmen on the loose and one countless mass killing after another, have you ever imagined how horrifying it would be to become a part of the evening news? Ameriguns tells the story of Nathaniel Rider – an FBI Agent whose descent into horror begins when he receives a phone call from his sister-in-law who is under siege at the DC wedding that she and her husband are attending. Concerned for their safety, Nathaniel calls 911 then rushes to the scene to rescue his family. The rescue doesn’t quite go the way that Nathaniel planned, however, and his life is irrevocably altered by the day’s events. Months later, Nathaniel finds himself investigating a new mass shooting – one that leads to a group called the Ameriguns – but the investigation takes a shocking twist when he discovers that someone is trying to frame him and he suddenly becomes the primary suspect in the FBI’s murder investigation! How will Nathaniel be able to prove his innocence when he can no longer trust his friends and co-workers, and finds himself the target of an FBI manhunt? What roles do a celebrity late-night television host and a gun-yielding Senator from Texas play in his fate? If you love political thrillers and mysteries that hook you from the very beginning and keep you guessing through every delicious twist and turn of the plot, then add Ameriguns to your must-read list! This review is an excerpt from my original review that is published at Create With Joy. Disclosure: I received a copy of this book from the author. The opinions expressed in this review are entirely my own. A thought-provoking and tense thriller. Well written and quite pertinent to a very divisive issue. I love how the book examines an issue in American culture but doesn't get preachy about it. The author merely presents a tense series of situations and documents how each character reacts to them. Looking forward to reading more books by Scott King. This was a fast-moving, gripping read all the way through. The characters and locations were vividly realized, and the plot kept me guessing. My only real complaint is it could do with another editing pass. There were a noticeable number of typos and inconsistencies, but not enough to throw me out of the story. Overall, a solid and entertaining thriller. I have to say this kept me on my toes I was as confused as Nathaniel to why he was singled out as well as to how this all would come together. The author sure doesn’t give many clues but keeps your attention. The person who is the leader is surprising at one point I thought maybe and decided no that just doesn’t seem right. The author hooks you from the start with action, killing, loss, pain as one man shoots up a wedding killing many and leaving Nathaniel hurt in more ways than one. As Nathanie I have to say this kept me on my toes I was as confused as Nathaniel to why he was singled out as well as to how this all would come together. The author sure doesn’t give many clues but keeps your attention. The person who is the leader is surprising at one point I thought maybe and decided no that just doesn’t seem right. The author hooks you from the start with action, killing, loss, pain as one man shoots up a wedding killing many and leaving Nathaniel hurt in more ways than one. As Nathaniel gets back on his feet there is a major shooting he is called in on leaving a few dead including the shooter. The book is based around the shooters, a gun control bill and how it affects Nathaniel. All fingers and evidence are pointing to him as they bring him in holding him trying to get him to confess he is at a loss for words. The reader is left guessing and torn whether to believe he is innocent or guilty. You mind will be blown away as to who is in control and the why of it. Mr. Summerer does a wonderful job of narration he really brings this audio to life with his many different character voices as well as the wonderful tones he uses to really pull you in making you a part of this listen. I had no trouble picturing the scenes as they unfold leaving me speechless at times. You have no trouble knowing who is talking and what they are feeling as the narrator gives you an action pack thrilling listen. There were no background noises or any places where the audio is higher or lower than the beginning of the last charter. If any breaks were taken you cannot tell. His female voices were just as wonderful as his males. His tones and emotions where right on the money leaving you with a wonderful clear audio that leaves you with your mouth hung open at times. The audio was clean, clear and crisp with true emotion being giving to each character. He really brought this audio to life for me making me feel a part of the book. I look forward to listening to more from this narrator. My heart really went out to Nathaniel, his brother and sister-in-law from the first few pages. The author gives you such pain that you have to close your eyes for a few minutes and let it sink in. As the book takes off on the next chapter Nathaniel and his family still pull on your heart. More shooting and more killings that have no meaning unless it has to do with the bill a few want to get past. Fingers are pointing all over the place but they always come back to Nathaniel. When one thing happens there is little doubt to those in charge that Nathaniel is the one behind it. They leave him no choice but to make a run for it. As he tries to work out who is behind it all trying to clear his name he gets in one mess after another. At times it is touch or go whether he will make it out alive. The author give you a wonderful plot that as it plays out pulling you in with some wonderful scenes and events that is very vivid with detail that will make you hold your breath. Nothing really makes a lot of sense to the why until the end which will blow you way. I really never saw that coming and had mixed feelings at the outcome. It really all made sense at this point but leaves you feeling a little sad. The ending was great and I totally enjoyed the story which was very entertaining. I did not care for the last chapter or so that went into detail about the leader. I felt that was not needed and for me took away from the story and the impact of the ending. If not for that I would have given this 5 stars. What I did like was the action, thrills, and even a few chills that kept the book moving at a fast pace for me. I found myself very invested and guessing to the outcome. The author does a wonderful job giving you the clues but keeping just enough held back to hold your interest. I thought it was really well written with a wonderful plot that plays out keeping you hooked until the end. I haven’t read anything by this author before and look very much into to reading/listening to more of his work. ""You should have shot him."" When Nathan, a field agent for the FBI, gets a panicked phone call from his sister-in-law telling him that a gunman was killing guests at the wedding she and her husband were attending, he grabs his own gun and rushes to the scene. Unable to get a clear line on the killer, he is himself shot and watches his brother die. Months later, after a long and painful recovery, he's back at work - and more apparently senseless shootings are terrifying the city. Why are they taking p!ace? Are they connected somehow? If so, who or what is orchestrating them? Eric Michael Summerer narrates this intriguing thriller with feeling. His pacing is excellent and the range of voices used to differentiate speakers is consistent and clear. Pleasant to hear, he really compliments the text and helps bring the story alive. And it is a good story, too, not only as an action thriller but also in conveying the devastation caused by such attacks to the survivors and loved ones of the victims. It also highlights both the pros and cons of carrying guns. An interesting addition at the end of the book tells the story of how it all began from the perpetrators perspective: a clever device, and rather sad. Oh me. Oh my. I have been looking forward to reading this book and it did not disappoint. I started and finished this book in like, 2-3 hours. Honestly. It was a quick read that grabbed my attention from page 1 and I did not want to put it down. If you have followed my book reviews on Life as Leels, you know that there is nothing I love more than a great “who done it” book and this was absolutely a gripping “who done it” book. The book opens with a shooting that I found to be very attention grabbin Oh me. Oh my. I have been looking forward to reading this book and it did not disappoint. The book opens with a shooting that I found to be very attention grabbing and pulled me right into the situation. It was the opening of the stars – the perfect opening. And everything just kept moving forward from there with shootings and shady characters. I figured out who the shooter was the same time Nathaniel did which really makes for a great book, but even once we figured it out; we had to know how it was all going to end. Very enjoyable book. Interesting, engaging and entertaining story. Pulls you in from the beginning and keeps you hooked until the end. The story is full of twists and turns, suspense, mystery, action and betrayal. There is a lot packed into the story for it being a shorter book. Took me quite a while to figure out this mystery. Why is someone trying to frame Nathaniel? What has he done to cause someone to attack hi this way? How is he going to prove his innocence? Who can he depend on to help him? These are just some of the questions Nathaniel faces as he tries to stay one step ahead of an unknown enemy. Eric Michael Summerer did a really good job with the narration. Nice voice. Clearly spoken. Smooth even pace with the narration. Good character voices. He was able to bring the characters to life through his narration. 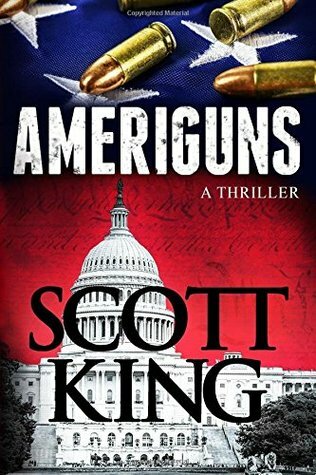 Ameriguns is the first book by Scott King that I have read, so I wasn't sure what to expect. What I found was a well written thriller. This is Book One in a series and does end in a soft cliffhanger as the story will be continued in the next book. There is violence. The book blurb adequately describes the storyline so I'm not going to repeat that info here. The author did a great job of explaining the settings and in making the main characters multidimensional. 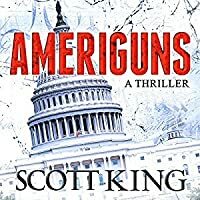 There is a lot of history between Ameriguns is the first book by Scott King that I have read, so I wasn't sure what to expect. What I found was a well written thriller. This is Book One in a series and does end in a soft cliffhanger as the story will be continued in the next book. There is violence. The book blurb adequately describes the storyline so I'm not going to repeat that info here. The author did a great job of explaining the settings and in making the main characters multidimensional. There is a lot of history between characters in the storyline that keep you guessing what twists and turns will be revealed next. Plus when politics, government agencies, and the media are involved...you get the picture. It definitely kept me riveted. I would not pick this book up normally. However, I am really glad I took a chance when the blog tour opportunity came into my inbox. The story moves at a quick pace and keeps your attention. There is plenty of action and a great cast of characters. Nathaniel Ryder is funny and smart. You root for him the whole time. Is there a romance element? No, but honestly I think it would take away from the drama of this great thriller. It’s a great book to sit down with if you’re in the mood for a puzzle. Scott King is an author and photographer. He was born in Washington D.C. and raised in Ocean City, Maryland. He received his undergraduate degree in film from Towson University, and his M.F.A. in film from American University. King is a game photographer based in Texa Scott King is an author and photographer. He was born in Washington D.C. and raised in Ocean City, Maryland. He received his undergraduate degree in film from Towson University, and his M.F.A. in film from American University. King is a game photographer based in Texas. His most common shoots are for websites, online stores, and for other marketing needs. He also produces an annual calendar that highlights board and other hobby games.